Alpen travels well and is packed full of the finest natural ingredients like juicy raisins, crisp wheat flakes, roasted hazelnuts, almonds, and rolled oats. Each box contains about ten portions for the average camper. Make sure you bring some powdered milk for your cereal. Try it Hot: On those chilly late season mornings warm the milk before putting it on the cereal. 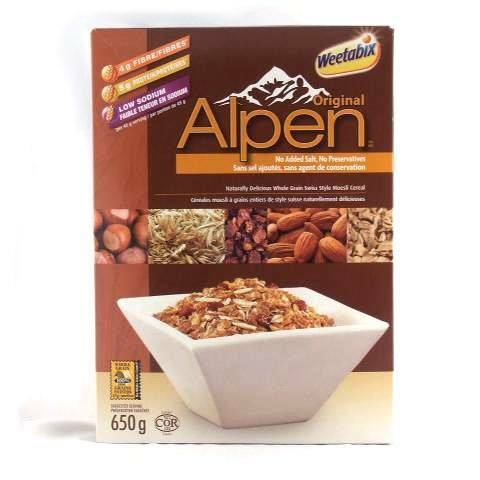 Alpen original contains the following ingredients listed in order of amount used. wholegrain wheat (37%), wholegrain rolled oats (36%), raisins (14%) (flame raisins, raisins), sugar, dried skimmed milk, roasted sliced nuts (2.5%) (hazelnuts & almonds), milk whey powder, malted barley extract, salt. Allergens: Product nuts, milk and wheat.